When I heard the rumours months back that MasterChef 2013 finalist Larkin Cen and Dale Williams were joining forces to open Hokkei I was intrigued. 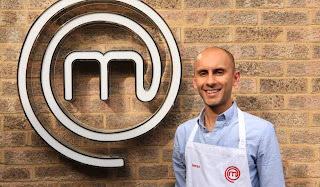 Being a big fan of MasterChef I remember watching their highs and lows as they progressed through the series and the fact that they were both from Cardiff made it even more exciting to watch, like supporting your home football team (as I don't support a football team, MasterChef is my Premier League). Set on the bustling Crwys Road in the heart of Cardiff's student area, Hokkei intends to improve upon the take away experience with the aim of providing 'Awesome Asian Food To Go' and the Hokkie Box itself is the centre piece of the menu. Billed as a perfect meal for one the Hokkie Box includes one main dish, a side, a dim sum and an extra. It just so happens that Mrs Clonc and Baby Clonc are away visiting the grandparents so a perfect opportunity for me to visit Hokkei Box on their opening day. The boxes have been amusingly themed under names such as Moo, Birdy and Piggy. I went for The King: Tiger prawns, ginger and spring onions as the main and then chose the triple cooked crispy beef as the dim sum, steamed rice as my side and spicy Asian slaw as my extra. The presentation of the food so neatly and precisely in the lovely Hokkei Box is excellent, each component in its own little compartment within the box sealed for freshness ready for you to tear into when you get home. The food, what shines through is the quality of the products that have been used and the care and skill that they have been prepared with. The triple cooked beef was excellent, crispy as you like (but not so much that you might want to visit your dentist the next day) covered in a sticky, spicy and sweet sauce. The prawns were proper tiger prawns and not the ones you normally get fobbed off with in Chinese or Indian takeaways. Beautifully cooked, plump and juicy with a hint of warming ginger and a crunch of slightly charred spring onion, stunning. The steamed rice, cooked perfectly and the spicy Asian slaw provided a welcomed zing of freshness. My complete meal came to £14.95. They do deliver but I waited for my order to be made up which took a matter of 15 mins or so. A lovely touch was a cup of complementary Chinese tea while I waited. Hokkei is by far the best take away I have had of any genre. So slick in its presentation and delivery of flavour. I am definitely a fan and would highly recommend people try out a Hokkei box for yourself. The question is which Hokkei box are you? In the meanwhile I need to hide this box before Mrs Clonc gets home and realises I went to Hokkei without her!